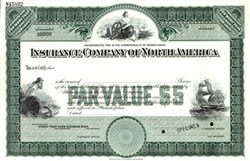 Beautifully engraved specimen certificate from the Insurance Company of North America printed in the 1920's. This historic document was printed by the American Banknote Company and has an ornate border around it with vignettes of a sailing ship and allegorical women with seascapes in the background . Insurance Company of North America (INA) is the oldest stock insurance company in the United States, founded in Philadelphia in 1792. It was one of the largest American insurance companies of the 19th and 20th centuries before co-founding CIGNA in 1982. Since 1999 it has been a subsidiary of global insurer ACE Limited.